From 26 October 2018 on, the Experience Centre “Naturgewalten” in the village of List on the German island Sylt will be showing the touring exhibition “Mensch ∙ Müll ∙ Meer” developed by our partner EUCC – D.
Another station of the exhibition presenting findings and educational background information on water pollution takes place in the Polish Natural History Museum of the island Wollin – Wolinski Park Narodowy. It was the first of 23 National parks founded in Poland. it has been open since 21 September. The exhibition remains on the Polish Baltic Sea coast until the beginning of November 2018. Afterwards it moves to the city Niechorze to the Museum of Sea Fishing . In Germany and Europe, numerous initiatives have been launched recently to counteract the problem of marine waste, to develop solutions and to raise awareness among the population. In our touring exhibition, an artistic exploration of the topic of marine pollution promotes community discourse. 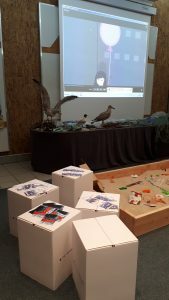 The European Coastal Union (EUCC-D) supports The Universal Sea as a scientific partner and developed the travelling exhibition “Mensch ∙ Müll ∙ Meer” (Human ∙ Waste ∙ Sea). The exhibition uses an oil-barrel-based design concept to show the viewer the origin of marine waste. Furthermore, its impacts on the sea and coast are shown. In particular, the waste found at clean up events show how massive the problem is. At the exhibition in Sylt there will also be exciting things to discover for our little visitors. Illustrator Christoph Tillmann (“Löwenzahn”) has umgesed a banner – where Lup, Lars and the lighthouse take everyone on a journey where you can see how rubbish gets into the sea. In addition, the German winning films of a europe-wide video competition will be shown. Children and grown-ups show their self-made video contributions on how to overcome the problems of the increasing pollution of the oceans. The exhibition was organized within the framework of the MARLISCO 2014 project and developed in parallel in 14 countries. It was very successful in Germany, in the MEERESMUSEUM Stralsund, at the interactive public show WASsERLEBEN in Berlin, and many more. Now the exhibition is coming to the ‘Erlebniszentrum Naturgewalten’ in List on Sylt.It is open every day from 10am to 6pm. More information HERE.